Its definitely that time of year where I am craving all things carby! Bagels, mashed potatoes, creamy soups, yorkshire pudding etc. Once the weather starts cooling down I need some warming up. So here's me finding balance! Keeping it light and fresh in the morn, then allowing myself to slip into a carby coma at night haha. My rule of thumb is to start my day out as clean as possible. First thing, I chug a glass of cold water, then make a smoothie. Lunchtime is usually salad with veg, and a protein like beans, eggs or tofu. Dinner, dinner, tacos are the winner. And then most nights I nightcap with potato chips, wine and netflix. (Don't judge). When it comes to smoothies, the options are endless. 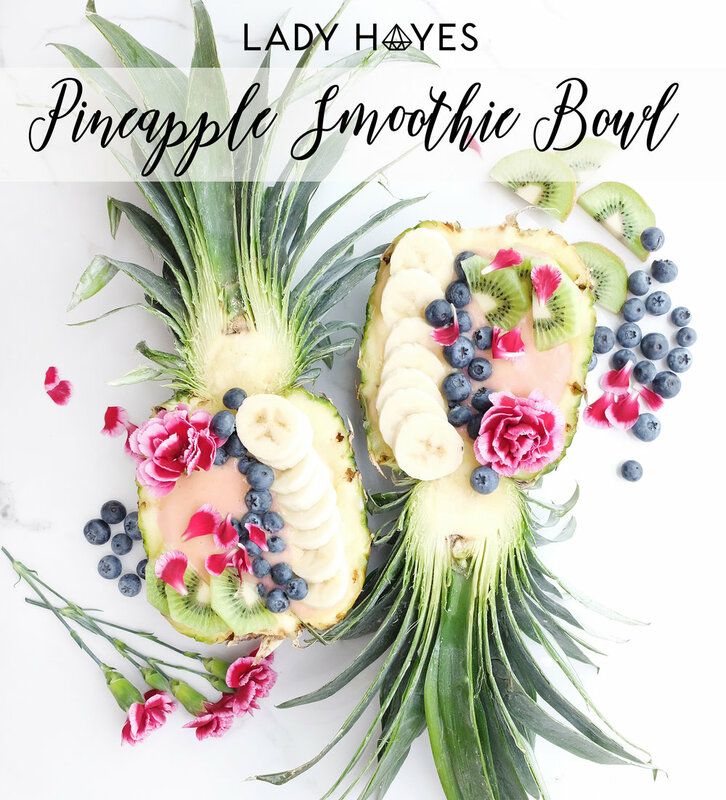 Pineapple Smoothie Bowls are a great way to add some beauty to the start of your day! Here's a few tricks to make these things delicious! 1. Ripe bananas! They keep it sweet. 2. Freeze your fruit. Store bought or toss ready to eat fruit in the freezer instead of letting it go bad in your fridge. I'm not a fan of using ice. 3. I like to use almond, coconut or cashew milk. Keep it light. OK! So lets do this. Use a sharp knife to cut your pineapple in half. I recommend cutting the fruit first then cut the leaves. Oddly, we do not have a single sharp knife in our house so mine looks a little hairy! haha. Cut around the inside of the fruit with your knife and then scoop it out with a spoon, creating a bowl. I cut the harder core out of the pineapple then compost it, toss the rest right into the blender. Add your banana, frozen fruit and milk. For me the fun part is the toppings! 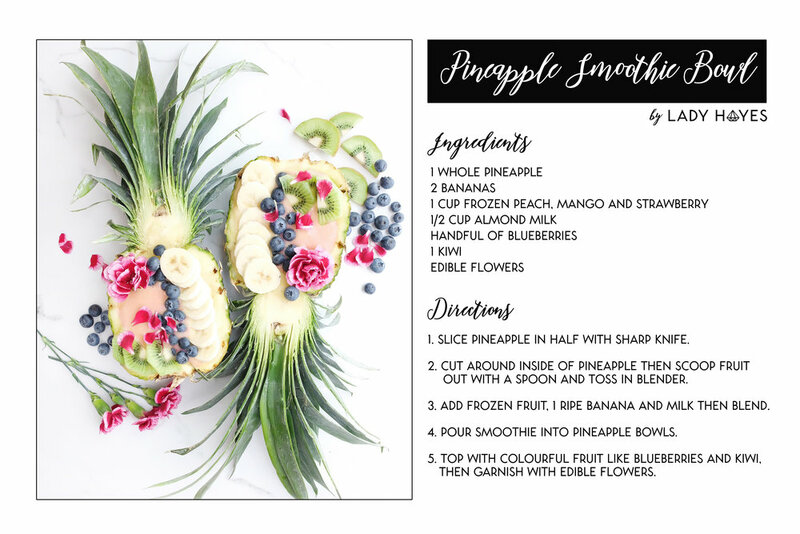 I like to add sliced banana and a couple other colourful fruits. Garnish with some edible flowers like garden grown carnations, pansies or marigold. If you're unsure if you can eat the flowers, just use them as decorations. Other healthy and tasty things to add might be shredded coconut, chia, hemp seeds and granola! Yum!